Amazon has launched an updated entry level Kindle e-book reader. The new standard Kindle will be thinner, lighter, and offer twice the memory of the previous generation device at the same price - $79.99 / £59.99 (including 'Special Offers'). Available in black and white colour options the new Kindle will include one further important hardware change to enhance accessibility: built-in Bluetooth audio support. In a statement accompanying the launch of the new Kindle, Arthur van Rest, General Manager, Kindle, said "Tens of millions of readers around the world have Kindle e-readers and today, we're excited to make our most affordable Kindle even better, while keeping the same breakthrough price point". Van Rest went on to assert that "With a thinner and lighter design, twice the memory, and all the features customers love about Kindle, it has never been a better time to be a reader." The new lighter design will be welcome as an e-reader is often held aloft with one hand. Furthermore, Amazon has made the new Kindle's corners slightly rounder for comfort. The new Kindle measures 160 mm x 115 mm x 9.1 mm and weighs 161g, fact fans. 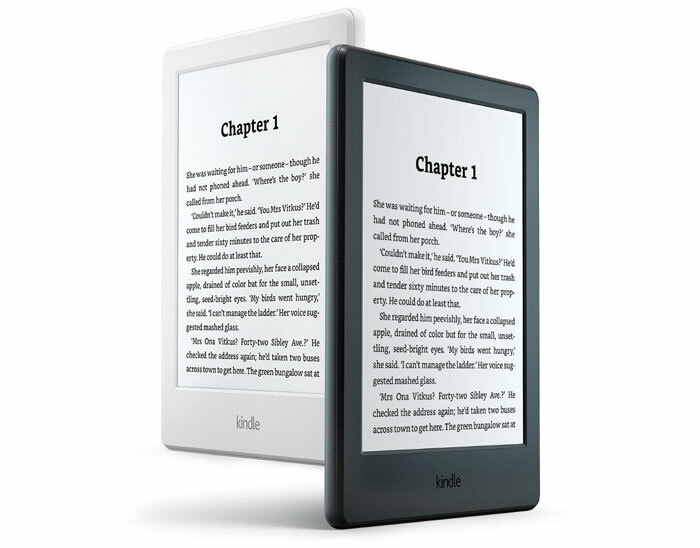 Traditional reader friendly features remain, including the easy on the eyes 6-inch e-ink screen and a battery life measured in weeks rather than hours. Bluetooth audio is present for the first time in a Kindle. Amazon says this communications hardware "makes it possible for visually impaired users to use the VoiceView screen reader on Kindle to read the content of the screen—including reading books and other Kindle content," without the need for an adaptor. You just need Bluetooth headphones or a Bluetooth speaker system. Amazon has implemented an Export Notes feature so you can send notes and highlights from your readings to email as a PDF or simple text file. Other new reading features include Chinese Word Wise hint options, and a Personalised Home Screen which seeks to make access to wish lists, recommendations and navigation quicker and easier. If you are interested in the new Kindle you can pre-order it today but it won't ship until 20th July in the UK (date may be different in other world regions). You'd still be crazy to buy this over the Paperwhite, reading devices need to have the highest possible ppi. If you're buying a kindle you're probably doing it because reading on an LCD display is unpleasant, not sure why you'd subject yourself to other unpleasant experiences by accepting 167 ppi. The new colour is interesting though. I agree with you completely. It's all to do with the reading experience, and a Kindle doesn't cut it. Go buy a real book. Perhaps because some people might be able to afford £60 for this but not £110 for the paperwhite. You don't need a fantastic PPI for e-ink. It makes a massive difference on LCD but not so much for a kindle. Have a look at your average book, the printing is often pretty poor but people don't complain about that.